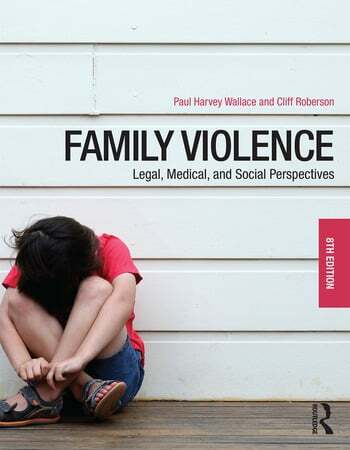 Family Violence: Legal, Medical, and Social Perspectives examines the entire spectrum of family violence, focusing on social processes and social relationships. The eighth edition is a multidisciplinary introduction to the study of domestic violence that guides readers to a better understanding of the challenges involved in reducing or eliminating violence. The new edition includes more information on PTSD and head trauma, a new section in children witnessing domestic violence, more international perspectives, which allow students to understand that family violence crosses borders and cultures, and a series of Promising Practices boxes that bring professional knowledge and accomplishments into the classroom. Cliff Roberson LLM, Ph.D is an Emeritus Professor of Criminal Justice at Washburn University, Topeka, Kansas and a retired Professor of Criminology at California State University, Fresno, California. He has authored or co-authored numerous books and texts on legal subjects and victims’ issues. His previous academic experiences include Associate Vice-President for Academic Affairs, Arkansas Tech University; Dean of Arts and Sciences, University of Houston, Victoria; Director of Programs, National College of District Attorneys; Professor of Criminology and Director of Justice Center, California State University, Fresno; and Assistant Professor of Criminal Justice, St. Edwards University. Dr. Roberson’s non-academic experience includes U.S. Marine Corps service as an infantry officer, trial and defense counsel and military judge as a marine judge advocate; and Director of the Military Law Branch, U.S. Marine Corps. Other legal employment experiences include Trial Supervisor, Office of State Counsel for Offenders, Texas Board of Criminal Justice and judge pro-tem in the California courts.